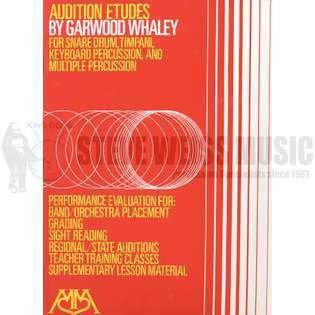 Audition Etudes, written by Garwood Whaley, is a source book of original graduated reading studies for band/orchestra placement, grading, sight reading, regional/state auditions, teacher training classes and supplementary lesson material. Contains a wide variety of meters, keys, dynamics, tempi and rhythms. An evaluation chart for each instrument is included. Great book of not only quality audition material, but also great pieces for sightreading. Excellent material in a range of styles and keys for snare, timp, keys, and multi. I have my kids read out of this all the time and it works wonderfully. Thank Whaley again for a great publication. great collection of short snare, mallet and timpani etudes. leave it to garwood whaley to write pieces that are both instructive, musical and interesting to play.